This is Fred. Fred is free again. They may not be from space, but octopuses are still incredible, intelligent creatures. One California fishmonger in Morro Bay certainly thinks so. 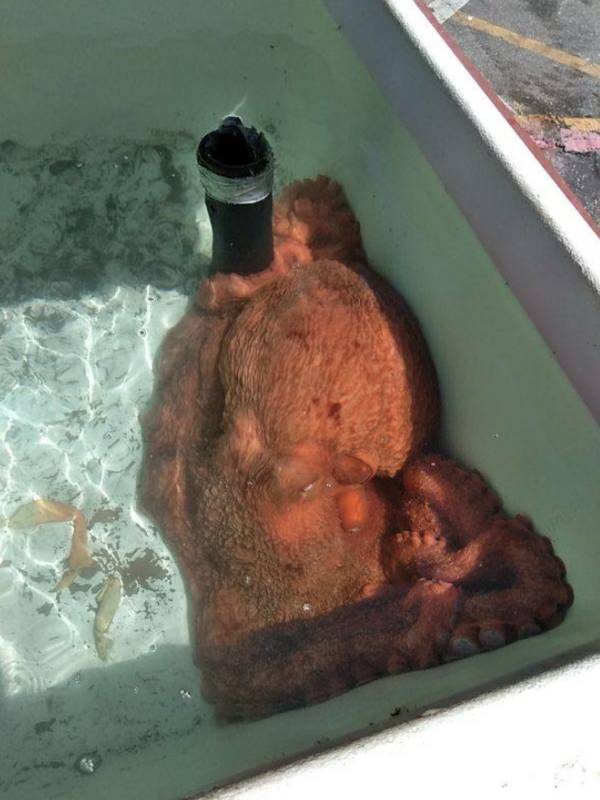 Earlier this month, Giovanni "Gio" DeGarimore, owner of Giovanni's Fish Market, bought a 70-pound octopus -- who has been named "Fred" -- for "a couple hundred dollars" just to release it back into the wild. And he says he'd do it again. DeGarimore said he didn't intend for his action to get as much fanfare as it has, but said he would be happy "if my little contribution can make a bigger difference in the world." That contribution includes no longer selling any octopus-related products on his website, which serves customers across the country, he said. "It'll hit me in the pocket, but I'd rather stand for something," he said. Evidence of the octopus evolution show it would have happened too quickly to have begun here on Earth. Published in the Progress in Biophysics and Molecular Biology Journal, 33 scientists have declared the invertebrate sea-dweller an alien whose eggs landed from space. But the scientists go on to make an even more extraordinary claim concerning octopuses, which seem to have evolved on Earth quite rapidly something like 270 million years ago, 250 million years after the Cambrian explosion. The paper states: “The genome of the Octopus shows a staggering level of complexity with 33,000 protein-coding genes more than is present in Homo sapiens. “Its large brain and sophisticated nervous system, camera-like eyes, flexible bodies, instantaneous camouflage via the ability to switch colour and shape are just a few of the striking features that appear suddenly on the evolutionary scene. “The transformative genes leading from the consensus ancestral Nautilus to the common Cuttlefish to Squid to the common are not easily to be found in any pre-existing life form – it is plausible then to suggest they seem to be borrowed from a far distant “future” in terms of terrestrial evolution, or more realistically from the cosmos at large. “One plausible explanation, in our view, is that the new genes are likely new extraterrestrial imports to Earth - most plausibly as an already coherent group of functioning genes within (say) cryopreserved and matrix protected fertilized Octopus eggs. The amazing suckers on octopus arms aren't just for sucking. They also are used to smell and taste. To deal with all that sensory input, the vast majority of an octopus's brain cells are in its eight arms! The scientists commenting on the E/V Nautilus live stream just can’t contain themselves when it comes to this adorable Flapjack Octopus. Actually it's an Octopus Stinkhorn (Clathrus archeri), a type of fungus. But a girl can dream, can't she? (University of Melbourne researcher Jasper) Montana and his team first caught the octopus in the act of burrowing in 2008 when they were scuba diving at night in Port Philip Bay, south of Melbourne, Australia. When they shone a light on the octopus, the startled animal spread out its arms and repeatedly injected high-powered jets of water into the sediment using its funnel. This caused grains of sand to be temporarily suspended in water, making it like sandy water. They (later) found that the animal used its arms and mantle to push the sand away and form a burrow. It also extended two arms to the surface to create a narrow chimney to breathe through. Finally, it secured the walls of its new home with a layer of mucus that kept the grains of sand together so the entire thing maintained its shape. Judy Fox's "Octopus" is an awfully lovely piece -- it's repped by LA's Ace Gallery. The expressive insouciance of the tentacles are what really make this wonderful lantern-bearing-octopus sculpture by Scott Musgrove. Isaac Krauss's octopus table is a fantastic piece of work -- I want a giant brass octopus for my house! Then, while taking his first bronze sculpting course, Krauss unearthed the idea and set to work. He admits to having had very little experience working with bronze, but felt that stretching beyond his limits would push him as an artist. 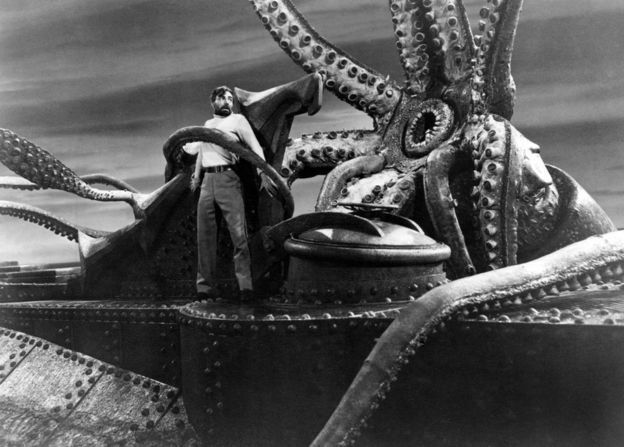 The most difficult aspect of this project, according to Krauss, was the detailed suction cups and applying them to the octopuses eight arms. For this, a close friend of his helped him out and also assisted in carrying through with the project till its completion. Overall, it took 1500 hours of work and $5000 to create this marvelous piece of art. Perhaps you've heard the tale of the octopus that broke out of its tank at the aquarium and walked across the room to break into another tank where it proceeded to eat other forms of sea life. That story is kind of an urban legend. It's supposedly happened at every aquarium in the world, but can't be confirmed. And experts have told me that the hard floors in an aquarium would likely seriously damage the suction pads of any octopus that tried it. But the basic idea—that an octopus could pop out of the water and move across dry ground&dmdash;is a very real thing. Here, an octopus at the Fitzgerald Marine Reserve in California hauls itself out of the water, and scoots awkwardly around on land for a little bit (while some apparently Minnesotan tourists gawk), before sliding back into the water. It's not the most graceful sort of travel. But it can be very handy. Octopuses do this in nature to escape predators, and also to find food of their own in tidal pools. As an added bonus: Scientific American just started an all-octopuses, all-the-time blog called The Octopus Chronicles. Check it out! Last year, I interviewed Binyamin Hochner of Hebrew University about his work developing new robotics systems based on the neurobiology of octopuses and other cephalopods. That interview ended up being incorporated into a video about cephalopod intelligence that was posted here on BoingBoing. Long story short: Cephalopods don't have their neurons organized in the same way that we vertebrates do. An octopus has as many neurons as a cat, but instead of relying on a central brain, the octopus' neurons are far more scattered. Some are centralized into what we might think of as a "brain"—in this case, a donut-shaped organ that actually wraps around the octopus' esophagus. But the bulk of the neurons are distributed throughout the octopus' body. When the octopus moves, the centralized and decentralized neurons work together, sharing information and the duties of processing and control*. Researchers like Hochner think that distributed processing system could make for better robots that can do more thinking on their own. Now, his work is paying off. In the video above, you can see the robotic arm produced by an interdisciplinary, team funded by the European Commission, of which Hochner is a part. 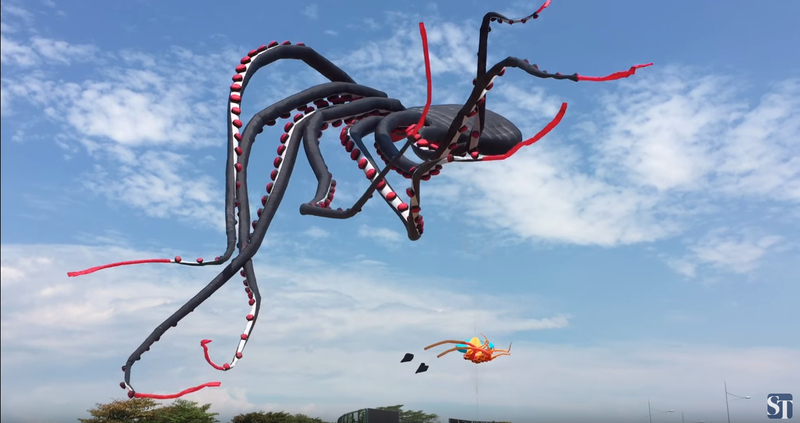 The 17-inch arm can grasp objects and is the first step in a larger plan to build an entire robot octopus. I'll say that again, "Robot octopus." Feel free to squeel with delight.